Participants could choose from four distances to experience riding the Ronde. The majority (5,270 cyclists) completed the 139km, more than 4,000 did 174km and no less than 4,550 opted for 229km setting off from Antwerp this morning at 7am. A further 2,150 participants chose the 74km. At 8pm, the final few cyclists trundled over the finish in Oudenaarde where the winner of the pros will throw his arms in the air on Sunday afternoon. The youngest and their parents also got the opportunity to do the same when they crossed the finish line after their (shorter) Ronde van Vlaanderen voor Families. True to form there were plenty of former pros and public figures also riding their Ronde: Minister Alexander De Croo, UCI-President David Lappartient, Johan Museeuw, Pippo Pozzato, George Hincapie,... The many (unknown) foreigners accounted for just over half of all participants and were amazed by the Flemish roads, hills and cobblestones. Two Spaniards reminisced about Sagan's crash on the Kwaremont last year. 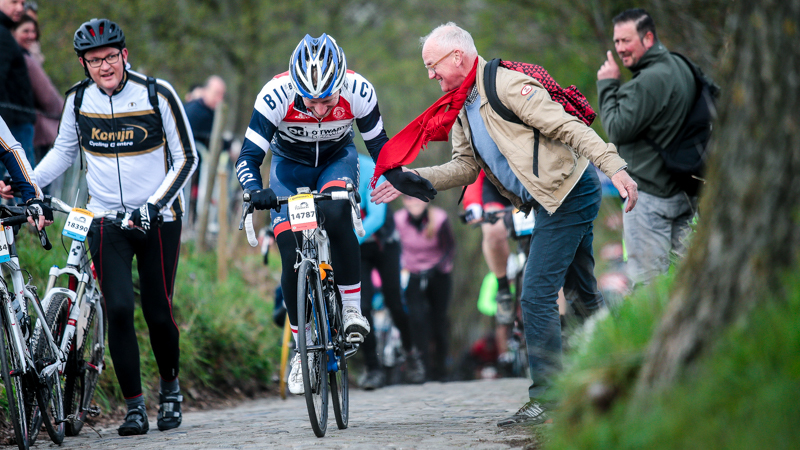 One man from Texas put it in words thus: "Today, I felt like I was one of the Flanders Pros. Everything went very smoothly along the way as well." Four Brits from Bristol thought it was "a great experience, both the actual ride and the refreshing pint at the finish...". What is also remarkable is that there were very few incidents or problems along the course, in all likelihood this was thanks to the dry weather and the extensive facilities to guarantee everybody's safety and comfort. The organisation's call to not only respect the traffic regulations, but also each other, other road users and the environment, was very well observed. The race marshals, police as well as technical and medical emergency services provided for a safe tour. One participant who became unwell on the Muur is already recovering thanks to a very speedy intervention by the Red Cross who had several posts in strategic locations along the track. Once all participants get back from their Ronde, they can relive their accomplishments and watch video footage and photos of their ascents of eight hills and share them with their friends.